Note: SafetyKnife.com manufactures and distributes all the products you find on this site. STOP Increased Workmen’s Compensation Insurance claims. At SafetyKnife, we offer a wide range of truly innovative knife designs that provide effortless protection from puncture and laceration dangers. No sharp points to prevent dangerous puncture wounds. 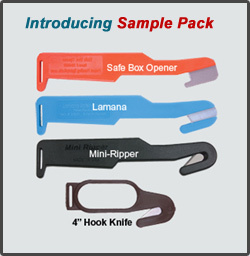 Our complete line of patented products are innovative tools designed with user safety in mind. These allow cuts to be made by pulling the knife safely toward the user in a natural cutting motion. This offers superior safety over open-bladed knives by eliminating the dangers associated with slippage. We offer a complete line of patented Safety Knives to fit your needs. Our plastic knife designs are lightweight and tough. Our all-metal knives are made from aircraft-grade, anodized aluminum and offer replaceable blades. All our knives come complete with super-sharp stainless steel blades and offer extreme resistance to environmental degradation. Tour our site and learn about the different knives, their uses, and their advantages. Contact us if you have any questions or wish to order our products. © 1997-2013 Vanguard Technetics, Inc. All rights reserved. Other products and companies referred to herein are trademarks or registered trademarks of their respective companies o rtrade mark holders. 2014-2016 SafetyKnife Inc.